I took a look at Pixel Prospector's list of indie dev press kits and starting thinking of ways to organize my game stuff in a professional way as practice for when I try to get big-time game journalists' attention. I thought that using the presskit() program would be as easy to use as Blogger has been for running this website, but it turns out to be more complicated than that and may even cost some money to run over the years. It's basically not something to be handled in the middle of a school week and I'll have to put it off until I have time to look into making a great game press kit. 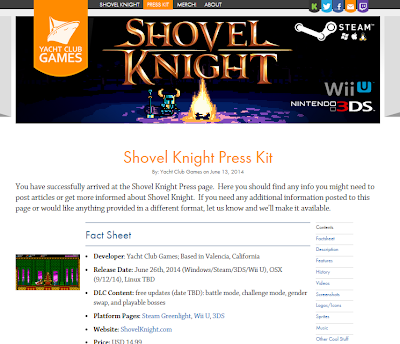 Making something nearly as nice as Shovel Knight's on a budget of zero is harder than I thought it would be. Having a press kit is valuable because it's what journalists want to see so they can do write-ups about your game with all the assets they need in one place. 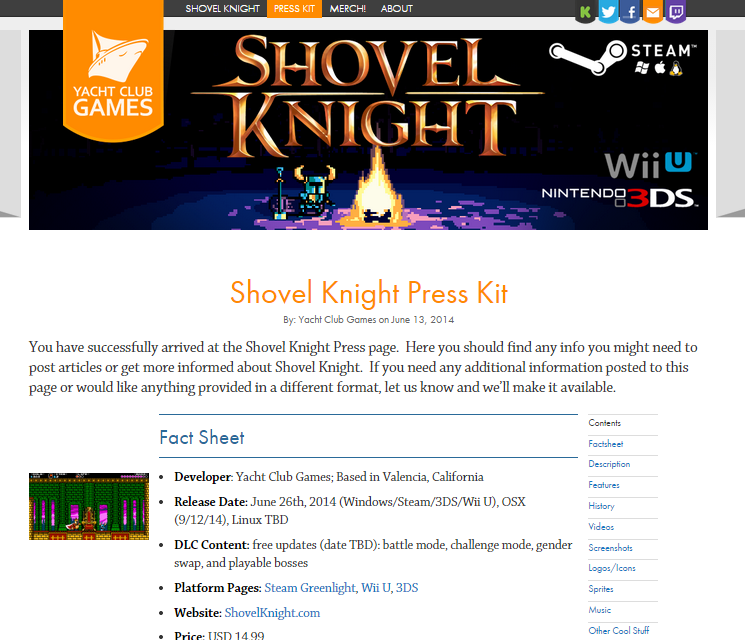 Things like screenshots, trailers, promotional graphics, and information all in both visible and downloadable form. I know I could use something like Dropbox or a public Google Drive to hold downloads (I'll need to pay for premium storage in the long-run) but finding a webpage to keep it on is problematic. Presskit() (pronounced "do press kit") is a tool that should enable me to host it on a server and hardcode how my press kit looks so it may be the long-term solution I'm looking for. It'd be easy if I could just make tons of extra blogger pages with images, text, and links but Blogger limits your pages to 10 and the way around that is outdated. I'm considering just making a regular post with all the stuff I need but by the sound of things it may not archive properly long-term. It's worth a shot right now though and it's good practice for whenever I get presskit() up and running. If Goat Simulator and Five Nights At Freddy's can get covered everywhere with no real press kits it proves that they aren't 100% required. Still, it's a nice thing that could increase your chance of getting covered. The only reason I'm not going all out with press contacts with this game is because I know I have something else on the way that would be a much better introduction to what I plan on doing throughout my career. The game I really want to be known for. Until I get started on that game, a Unicorn Training press kit will be just be a template if I decide to make one at all.